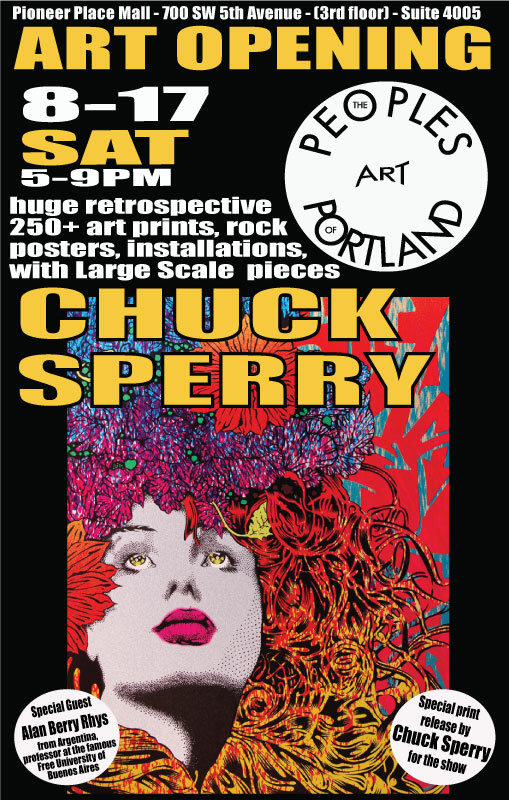 The Peoples Art of Portland’s current show A Chuck Sperry Retrospective features over 250 gig posters, political poster, art prints, and large scale pieces by world renowned screen print artist Chuck Sperry. This is definitely Chuck’s largest show to date. Chuck attended the Opening and had the chance to sit down with the People’s Gallery opening night for an interview. The show runs until September 15 and pieces are now available to view or purchase online at TheGoodfoot.com – see more pictures from opening night at ChuckSperry.net. join the discussion on ExpressoBeans.com for more. Melissa Dixon liked this on Facebook. Alfonso D. Cradenza liked this on Facebook. Albert Grosklaus liked this on Facebook. Julio Tormo Baixauli liked this on Facebook.